The 2016 Holiday season is in full swing! That means champagne parties, eggnog, fruitcake, family and TARTAN! This time of the year, most of us are seriously obsessed with everything and anything that screams holiday! What better way to slip into the holiday spirit then to wear something tartan! Tartan (plaid pattern) originated in the late 17th century and is the symbolic national dress of Scotland. Today, tartan is generally worn by Americans during the holiday season. Red, green, white, and black signify traditional tartan colors that are literally woven into American culture and fashion, thanks to Ralph Lauren, L.L.Bean, Burberry and J. Crew. A flash of TARTAN evokes instant holiday nostalgia reminding us this season is absoulely the most wonderful time of the year! In celebration of gift giving, THE WANNA curated a tartan-centric gift guide for those who only want a touch of tartan to people who eat, sleep and dress in tartan year round! HAPPY HUNTING! Go to bed and wake up in the holiday spirit by surrounding yourself in tartan bedding. This season we love the royal set at Ralph Lauren called the "Tristin," from the sheets, shams to the duvet cover you can build a bed fit for a King! This comforter and duvet is pure joy made from yarn-dyed cotton which spotlights a traditional Scottish tartan, bringing heritage style to your home. J. Crew signature Royal Red Plaid cashmere scarf is the perfect gift to give and get! This cozy scarf is imported straight from Scotland and you won’t find them anywhere else! These Ralph Lauren Plaid Touch Gloves are a fashionable way to keep your hands toasty in the winter weather. These traditional black and red patterned tartan gloves are made of wool and polyester, with touchscreen-sensitive compatible fingers! This “flocked tulle” dress designed by Paskal reminds us of the style from the 1920s, but also has its own unique, modern holiday feel to it. The dress is woven with a grey, red and blue pattern and can be paired nicely with sheer tights and ankle boots. 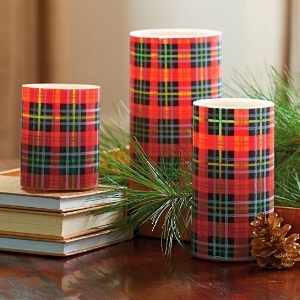 Light up those chilly winter nights all season long with Grandin Road tartan LED candles! Without the worry of an open flame, these cozy and classic tartan-print vellum candles will add to the cozy holiday feeling inside your home. Festive tartan carry-all for the holiday season! This winter we love Mark and Graham's green and navy tote with all the details! This cute tote bag features magnetic closure, vinyl accents, handy interior pockets and a free embroidered monogram. Made of 100% polyester and with vegan leather accents. 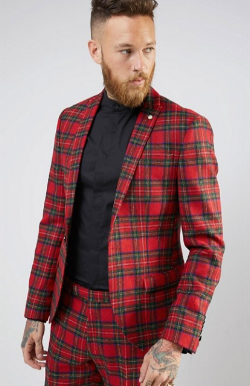 This festive tartan blazer from ASOS is the perfect gift for any classy, holiday-loving man! This blazer is designed by Noose & Monkey and is woven with 100% pure wool fabric in England to create an attractive, skinny fit. For the stylish ladies, this festive wool-twill blazer is designed by Vivienne Westwood. It is patterned with red and black tartan. Tailored for a loose silhouette, this piece has cutaway shoulders that add edginess to the classic tartan look. This Madewell long-sleeved tartan "boyfriend shirt" is the perfect casual holiday snag for low-key nights with friends and family, or a cup of hot cocoa in front of the fire. The top is made slightly oversized for a loose fit, in a “red sangria” tartan pattern. Looking for a gift for a furry friend? How about a festive tartan dog bed for the holiday season? This plaid dog bed cover boasts the perfect red and black festive pattern tartan. It is made with tightly woven twill to stand up to the rough and tumble movements of your beloved pup. Of course you only want the best for your furry BFF, and this luxurious dog bed from the Highland Prestige Collection will make your pup feel like royalty. Handmade to order from the UK, this bed is covered in a “brown watch” tartan with dark chocolate faux fur interior, and made of 100% wool Kinloch Anderson.